Would you love to wear dresses throughout your pregnancy? Are you finding it hard to find trendy ones that suit your style? “Fashion” and “maternity” aren’t often heard in the same sentence. But expecting mothers should be able to wear anything they want. Wearing dresses that you love may help you feel your best and you can show off your baby bump at the same time. Of course, you can feel comfortable too. 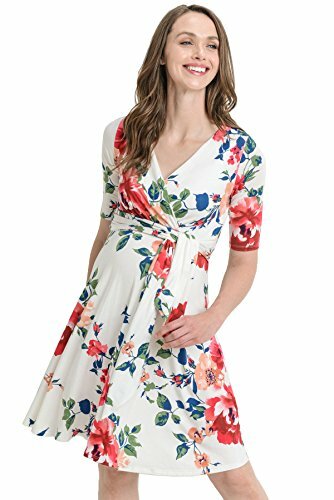 We’ve managed to hunt down some of the best maternity dresses. You can take a look at our favorites here. 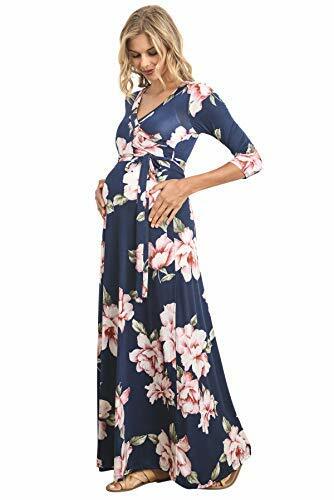 Use the links above to check the latest prices or read our in-depth maternity dress reviews below. The most important thing to remember is that you want to be comfortable. In particular, there shouldn’t be any pressure around your baby bump (source). 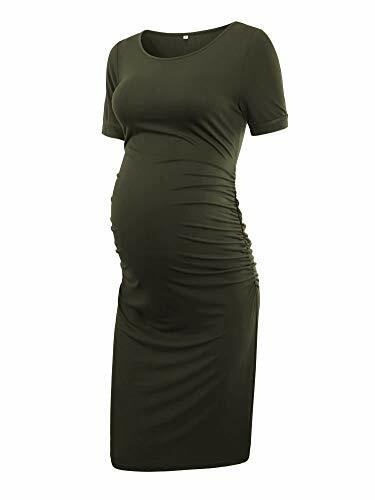 Let’s check out some of the things you should look for when you’re buying a maternity dress. One thing they didn’t tell you about being pregnant is that it’s harder to get dressed. 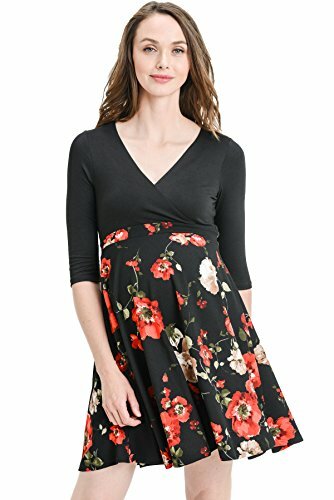 That’s why it’s important to look for a maternity dress that’s easy to get on and off over your baby bump. The best option is going to be a pull-on style. This means you can simply put it over your head. No zips or buttons to play around with, which is exactly what you need later on in pregnancy. 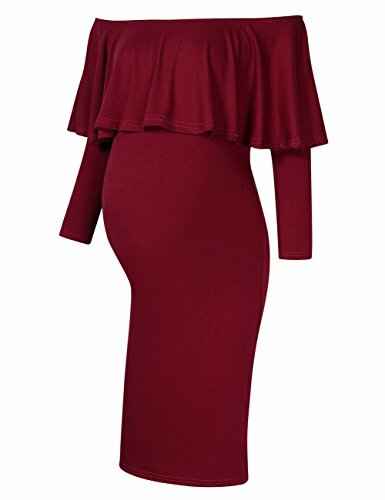 Your bump is constantly growing and the last thing you want is to buy a lovely dress that doesn’t fit. The best way to combat this problem is by choosing a design with ruched sides. This is a loose gathering in the material around the belly, which allows for stretching. It will grow with your bump and allow you to feel cozy at the same time. Whether the dress you choose is a floaty style or “bodycon,” you want the fabric to be soft. Be sure to check the label for the material used. Good choices include cotton, which is soft and provides warmth. Rayon is also a comfortable option that feels soft against the skin, as well as being stretchy if combined with spandex. Another good fabric for a maternity dress is viscose. This feels just like silk, which can create a soothing feeling. Now we’ve covered the basics, it’s time to announce our favorite maternity dresses. If you’re spending the day outdoors, consider this gorgeous maxi dress. It’s going to be comfortable with its soft material and airy feel. Plus, it’s a good way to cover your legs and avoid sunburn. It has a floral pattern, with a v-neck and three-quarter sleeves. There’s a detachable belt, which fastens under the bust. It’s made from polyester, so it’s durable and comfortable to wear. With a variety of patterns and colors available, including short-sleeved styles, you can also wear it after pregnancy since it’s nursing-friendly. The empire waist makes feeding easy and discreet when you’re out and about. When we’re pregnant, most of us want to show off our baby bump. Well, this bodycon dress is the way to do it in style. It’s breathable and casual, making it great for summer. There are lots of striped patterns available in different colors, but also some cute floral designs too. The added spandex and ruching will provide some stretch over your belly. Short-sleeved and knee-length, it could be adapted for cool weather with a cardigan and tights. Do you love to wear free and floaty dresses? This bohemian style may be great for you, with its flared hemline and pleated design. Since it’s made from 95 percent polyester and 5 percent spandex, it’s comfy and stretchy for expecting mothers. You can style it with whatever accessories you like. This means it can work for casual days out, as well as occasions when you dress up. A variety of solid colors is available. Do you hate the idea of buying maternity clothes to never wear them again? That’s why we love this floral skater-style dress. Not only can it be worn on any occasion, but it’s nursing friendly, with its deep v-neck and stretchy top section. Of course, during pregnancy, it’s also comfy since it’s made from 95 percent rayon. We appreciate the understated style here with its solid top and floral bottom part. The mini-length is bold, but it can easily be paired with leggings. Strut your stuff, glowing mama, with this off-shoulder neckline, knee-length dress. It has a unique lotus leaf collar that’s unusual and sure to make you stand out. Choose from many styles, plain or flowered; some have long sleeves and others don’t. 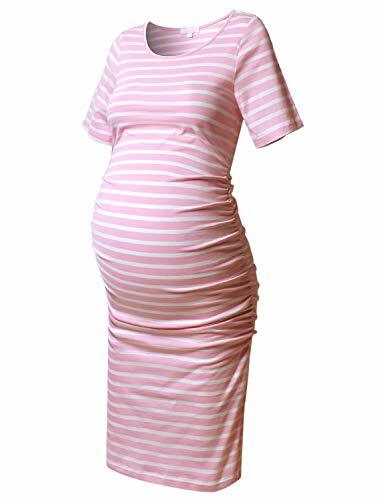 This dress will provide plenty of stretch and comfort for you and your bump, although apparently, they run a little small, so order a size up. This will make sure it’s a comfortable fit. Are you heading out with the girls to have some fun, or have a party invite? When you’re pregnant, you can still follow the latest trends while looking classy. The design of this dress is modern, with a crew neck and lace inset. The length reaches below the knees but the material still provides freedom of movement. If you’d rather wear other colors than black, this dress also comes in navy, dark green, or red. The only downside is that this dress is hand wash only. This is one of our favorite dresses for its carefree, yet sophisticated style. While you show off your bump, the ruched sides provide space and comfort around the middle. Fitted at the top and flowing at the bottom, it’s sleeveless, which makes it ideal for hot summer evenings. It has a scoop neckline and boasts a long maxi style. For a more formal occasion, there’s also a style option that includes sleeves and a fishtail bottom. Oh, la la. Don’t let pregnancy stop you from dressing up. This modern dress may fit the bill and allow you to feel at ease in a more formal setting. It has a lace design in a single color, with a sheer floral pattern down the arms and around the lower hem. It’s modest enough for any occasion. Both the lace and jersey have some spandex, so it shouldn’t feel tight anywhere. There are six colors to choose from, including hot pink and mint. You can enjoy a smart style with this short-sleeved dress. It has a classic design, and a pull-on closure makes it easy to wear. 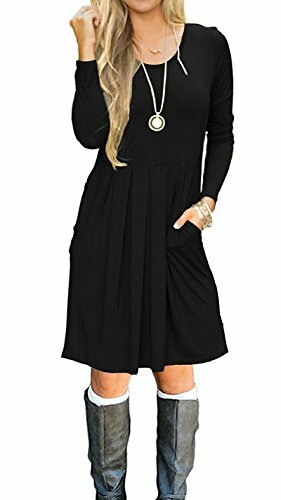 This dress is knee-length and has a round neck; the ruched sides allow for a growing baby bump, and it’ll feel soft and lightweight against the skin. You’ll find both solid and floral patterns, so there’ll be at least one to match your wardrobe best. Three-quarter sleeved options are also available. Everyone needs a dress for casual occasions. But if you still want to stand out and look fashionable, check this out. It has a long maxi style, which is floaty and loose for comfort. Having a low scoop neck and no sleeves makes it cool and comfortable on hot days. Do you prefer patterns or plain? There are quite numerous options for you to choose from. This beautiful dress is bright and colorful and has a v-neck wrap style with a cute tie. This means you can enjoy a comfortable fit at any stage of pregnancy. The sleeves reach just above the elbow and it’s above-the-knee length. The design also makes it easy to nurse your baby when he or she arrives. There are floral prints but paisley too, so the design is up to you. If you’re going to a wedding, this dress comes to the rescue, with its fashionable floral pattern that’s just perfect for a formal occasion. It’s a maxi style dress, so it’s ankle to floor length. It’s sure to be comfortable and not clingy around the stomach area, which is what you want. What’s more, the empire waist with a wrap-style top is brilliant for nursing when your baby is born. If you’re searching for an easygoing dress, look no further. 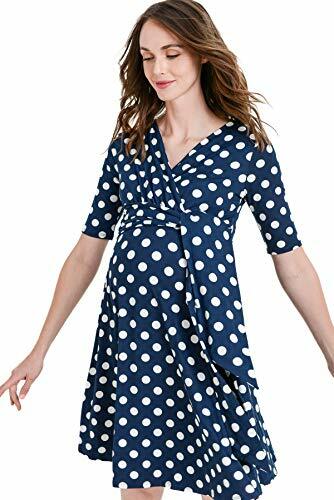 It has a lovely navy and ivory polka dot design that never goes out of style, with a wrap top and elbow-length sleeves. It’s a pull-on garment, which is perfect for pregnancy. The deep v-neck also means you can nurse your child when the time comes. If you prefer to have a relaxed fit that’s nice and roomy, we recommended choosing one size up. Many other designs are available. 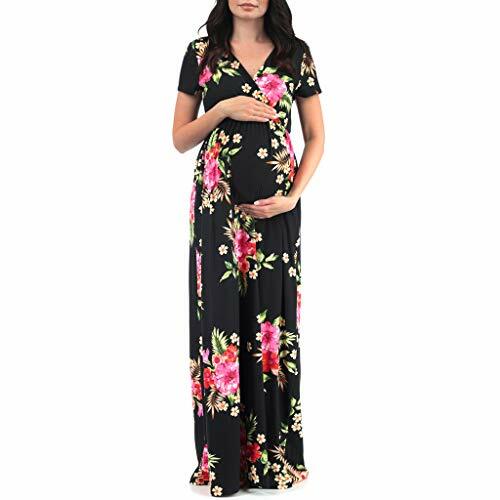 We love all of these maternity dresses, but our ultimate favorite is the Hello MIZ floral maxi dress. It’s made from soft materials for comfort while having a beautiful and trendy floral design. 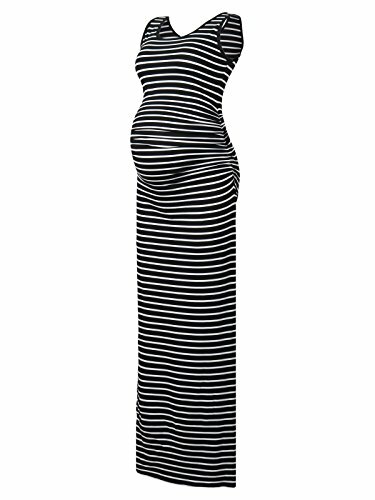 Don’t forget that you want a maternity dress to be easy to put on and wear, and stretchy or loose when you’re pregnant. Your comfort comes first. Is there a dress we’ve talked about which is your favorite? Comment down below and let us know!